So in recent posts I've referred to a "big project" or a "top secret project" that I've been working on... and here it is! I made the first knitted two-headed baby ("2hb" for short) for Tim at Double Fine Productions earlier this year, and then a few months ago he asked if I could make a few more to sell at their online store. So, hey, some of my stuff is for sale! I'm as amazed as you are. I didn't intend for this guy to be an elf, but he looks like an elf, so I guess he is one. Not the Legolas kind, the other ones, the wee kind. I wanted to make a toy with a tunic or dress, to experiment with that sort of "keyhole" shape - circle head, triangle body. So he's got a little dress, how nice! The dress can be removed, so perhaps I'll make him another saucy outfit. He ended up with a pointy head because of how I brought the stitches closed when I finished up, and the pointy head sort of looked like an elf hat, so there you go! I got this wonderful handspun stuff from Christine at tooknap press. 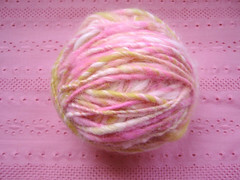 It's an angora/wool blend and its name is Pinky Lee. I'm not sure if I'm going to use it in a toy or make a simple scarf out of it. In the meantime it's sitting in my "nice yarn" basket (along with some Noro Kureyon and a really teeny tiny skein of Anny Blatt angora), and I just like to look at it and occasionally pick it up and stare at it. The tooknap blog is here... she posted about the book Unexpected Knitting a few months ago, and I totally second that emotion. Debbie New's knitting is really utterly amazing, I can't get over some of the sculptural knitting she does - particularly a couple of tea cups & saucers and a pitcher plant. Speaking of knitting, and yarn, I just went to artfibers in San Francisco, and really appreciated not only their lovely selection of yarn (their own brand, they don't carry anything else) but the fact that they let you knit a swatch right there. Fab! Plus, they have a discount room, where you can buy little remnants of yarn by the gram, perfect for toy knitters like me. And to top it all off, the staff was really friendly and helpful. *Mia Hansen is a really amazing artist who, among many other things, makes some very cool toys (click on the "objects" link). I'm really into the fact that they are 2D designs on a 3D (stuffed) surface, a recent obsession of mine. 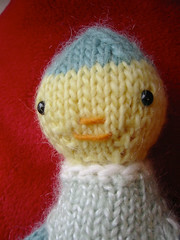 *I am very excited about the upcoming (September) publication of the book Knitted Babes by Claire Garland. 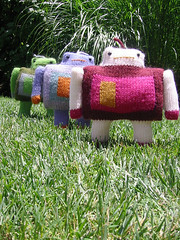 Cool and stylish knitted toys! Check 'em out. There's even going to be a knit-along. *Along with a bunch of other toymakers, I am participating in the Plush You! show at a toy store called Schmancy in Seattle. If you will be in the Seattle area in August, do check it out! Schmancy is located next to Fancy and The Moore Hotel on Second Avenue in Seattle, two blocks from Pikes Place Market. The opening of the show will be on August 12th, from 5 to 10pm. Um. I'm not sure about this guy... I kept resisting the urge to add bunny ears or cat ears or something to make him recognizably something, because he is meant to be an experiment in simplicity. But he's sort of odd looking. Perhaps there's such a thing as too simple? 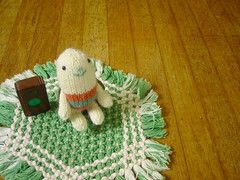 In any case, he was fun and quick to knit, as he's quite small and involved few increases and decreases. He's posing with some old dollhouse furniture I found in a store in Ohio. The Midwest is where it's AT for cool old stuff. 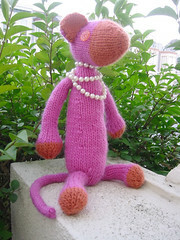 Here she is, Ms. Dangly, from the very fun pattern by cakeyvoice. I loved knitting this monkey, it's made of such strange and cool shapes and comes together quite nicely (and dangly, I might add). Cakeyvoice published the pattern in her blog, then challenged her readers to create a Dangly clone, so I complied. My only real changes were the colors and weight of yarn, to the very ladylike RPM Pink and Tiger Lily Lamb's Pride Worsted by Brown Sheep. Make one for yourself, or to share with a loved one. * the crocheted amigurumi-style toys of ElizabethD, m_patrizio, and ohsewpretty. I've linked to their flickr galleries so you can see how very cool and colorful their creatures are. I'm really inspired by the sorts of shapes they can achieve using crochet, I think I may have to break out my hooks again. * Kath Red's post about 70s fashion at her excellent red current blog got me thinking about all the 70s craft books I have laying around. How did that happen? My fave right now is a series called Creative Hands, of which I have about 5 volumes. I love the hot pinks, lime greens, bold shapes and general "why not decorate that thing there?" spirit of 70s crafting. My mom was a crafter in the 70s and I used to spend hours looking at her books. So many folks with shiny straight hair making funky earthy handmade stuff. Good times. * Japanese craft books continue to be a major inspiration to me, and from the blogs I read I can tell I'm not alone in that. I have a few that I keep going back to when I feel like I'm getting stale, including the Aranzi Aranzo photo comic books and the Anano Cafe books. When I visit the bookstore at the Japantown in SF I'm always amazed at the creativity in the craft books available, and the sheer breadth of topics covered. I would love for someone to start translating some of these into English and publishing them here - or perhaps I need to learn to read Japanese? * Sanjay Patel's illustrations for his book Little India are so fun and gorgeous. I used to work with him at Pixar and I was happy to run into him the other day at an art store, where we chatted about the nature of cuteness in art and design. I recommend you have a similar dicussion with someone very soon, it's the best. This stuffed toy is a collaboration between Jeff and I. He drew the picture, I traced it onto a piece of fabric using the old tape-it-to-a-window trick. 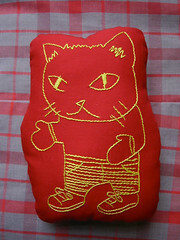 I then embroidered it, cut it out, sewed on a piece of backing fabric, then stuffed it. I used this same technique (if you could call it that) on the toy I made for the Alice in Wonderland-themed Month of Softies. Embroidery is the bee's knees. And I can do it while I drink a beer, which I can't do while I'm knitting! This would be a very scary photo if a) the robots were taller than 9 inches b) the robots were made out of something harder than wool c) the robots were able to move of their own accord d) it hadn't been such a bright and sunny day. What a relief. But still, a robot army of any sort is a little disconcerting, don't you think? Individual photos of the robots can be found on flickr (click on the group photo).